Jan. 19 (Bloomberg) -- Cameco Corp., the world’s second-largest uranium producer, may be more interested in acquiring Paladin Energy Ltd. after the Australian company fell 15 percent in three months, RBS Equities Australia said. The Australian uranium producer on Oct. 29 cut its production forecast after delays to an upgrade at the Langer Heinrich mine in Namibia and the replacement of equipment at the Kayelekera venture in Malawi. Perth-based Paladin estimated production of 5.6 million pounds to 6.1 million pounds for the year ending June 30, down from a previous projection of 6.6 million pounds. Cameco declined to comment on a potential bid for Paladin. “As one of the world’s leading uranium producers, we are often associated with speculation about various business deals,” Lyle Krahn, a Cameco spokesman, said in e-mailed comments today. Paladin Managing Director John Borshoff didn’t immediately return a phone call seeking comment. 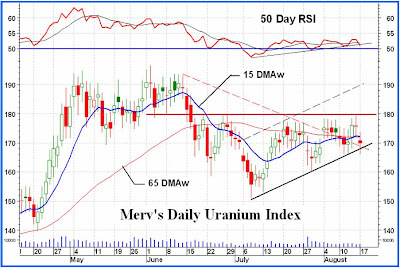 The Australian uranium producer’s shares have fallen 15 percent from A$4.80 on Oct. 19 to close at A$4.07 yesterday, compared with a gain of 2.5 percent for the benchmark S&P/ASX 200 Index. Paladin traded at A$4.05 in Sydney, down 0.5 percent, at 1:35 p.m. local time, valuing the company at about A$2.9 billion ($2.7 billion). Saskatoon, Saskatchewan-based Cameco, should it be interested in acquiring Paladin, would probably need to pay a premium of more than 30 percent to the Australian company’s share price, Fagan said by telephone in Sydney. Discussion of a potential Cameco-Paladin transaction isn’t new. JPMorgan Chase & Co. said in March 2009 that Paladin may be an attractive target for producers such as Cameco. Speculation that Cameco may buy Paladin is increasing, and a takeover would cost the Canadian company about A$4 billion, the Australian Financial Review said in its Street Talk column today. Paladin completed a share sale to institutional investors, raising A$429 million, the company said in September. Borshoff said last year the company may grow beyond Africa and Australia, while expanding its project in Namibia. Paladin will consider acquisitions of its own, he said in October. Cameco, which plans to double annual uranium output from its existing operations by 2018, will consider acquisitions of mining assets and creating joint ventures with customers, Chief Executive Officer Jerry Grandey said in November. Paladin Energy is among the companies Cameco considers attractive, he said. Even so, Grandey said: “We’ve always been challenged by the valuation.” Paladin shares rose 69 percent in 2009 to finish the year at A$4.18. Cameco agreed to sell its stake in Centerra Gold Inc. for about C$872 million ($850 million), the company said last month. The Canadian producer currently has “substantial financial capacity for acquisitions,” RBC Capital Markets analyst Fraser Phillips in Toronto wrote in a report yesterday.